Discovering "The Last Messages": Interview with Hannu Luntiala, part 1 - "Write now is good." 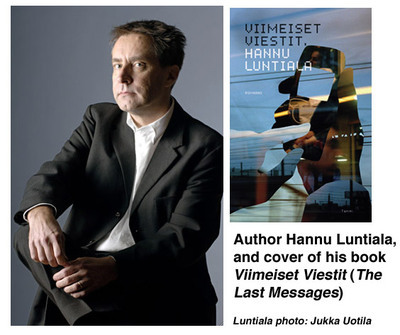 Finnish author Hannu Luntiala has written his well-received novel Viimeiset Viestit (The Last Messages) entirely in SMS, or "text messaging." In this first part of my interview with him, Luntiala describes his novel, the inspiration behind it, and why the SMS format works so well. 1. What inspired you to write a novel entirely in TXT messages? My novel The Last Messages tells about a man who travels away from Finland and all around Europe. It is typical for us Finns nowadays that instead of sending postcards, we send text messages when we travel abroad. I placed some text messages in the beginning of the story and it worked. Then I realized, why not tell the whole story that way. I tried that, and it looked great. Writing that way was at the same time fun and demanding. I had to limit every incident to 160 marks (characters). Fortunately, Finnish text messages can be that long. I suppose that in most countries, one can use only 20 marks. In that case, it would have been impossible to create enjoyable language, which was very important for me. 2. What is the basic plot? The story tells about an IT executive who leaves his job and family, without giving any reason, to revisit his youth. He sends text messages to his wife, his son and some friends, and receives messages from them. Step by step, it becomes clear that he perhaps is escaping from something, hiding something, and that he is not coming back at all. He doesn't reveal his plans to anybody, but in the end he tells what is doing. His motive dates back to the old philosophy of Confucius: If you know what is right, but you don't do it, you are a coward. 3. Is the story based on real events? In the beginning of 1980's, I traveled in Sri Lanka (an island south of India, formerly Ceylon) and I was sitting in a bus. Then I noticed a young blind man begging for money. When he received a bank note from an American tourist, he went to buy some boiled rice and ate it immediately. If he had not received the money, he would have starved. That event changed my life. I promised myself that some day I would tell about that touching event to as many people as possible. Now I have kept that promise. I have described this brief moment in the novel, but I don't want to spoil the story by revealing which "role" this event has in the narrative. 4. How long is the novel? Pages? Characters? Chapters? There are 332 pages in total, which is about 1000 text messages. The book has been divided into days. The story starts on the 27th of April and ends on the 19th of June the same year. So the time frame is about 50 days, and the number of text messages is, on average, 20 per day. 5. How does the TXT message format contribute to the novel's plot? The main-character is traveling away from his home, wife and friends. It is soon obvious that he is running from something, and he has not enough courage to admit this to his wife and friends. It is easier to communicate by text messages in that situation rather than meet the people face to face or discuss with them in the phone. It is also easier to act out different roles by using new media and technology. The story is a mystery, and by telling it with text messages, the atmosphere slowly becomes more and more puzzling. The reader has to fill the empty lines in the messages and also the empty space between the messages. An appreciative poet commented on the book by saying: "The messages in the novel are like windows; you can see part of the landscape, but not the entirety, the whole landscape. You can't see the horizon, and you have to guess what lies around the frames of the windows." 6. How is The Last Messages like a traditional novel? It is a printed book, it has a clear story, intrigue and some parallel tales. There is a main character and 5-6 side characters as well. It is more difficult to define the "type" of novel it is. Some readers think it is a thriller, some people consider it "social commentary", and some people say it is a story of deep human interest. I would say, it is all that, and besides, it also tries to challenge the morals of modern human beings. 7. Any advice on how to approach reading the novel? It is not difficult. The text messages, which the main character Teemu receives, are printed on the left side of every page, and the messages which he sends are on the right side. The messages are in chronological order. It is also easy to see who sends the message and when, or to whom Teemu sends his messages. After reading the first 2-3 pages, the idea is clear for most readers. 8. Were you surprised at the worldwide recognition of your novel? It has gotten quite a lot of press. Yes, it was a total shock for me. My son sent me a text message stating that by the end of January, just one week after its publishing in Finland, my name could be found in 22,000 Internet pages. I didn't believe, until I tried the search myself. It was true! Also, the interviews requests from around the world were a total surprise to me. I didn't always quite know, from which country and to which media they were interviewing me. Many took place in the middle of the night. In part 2 of our interview, Hannu Luntiala discusses his other works, his road to becoming published, and what might be next for The Last Messages. He shares some striking insights into technology's influence on literature and modern life, and inspiring advice for aspiring authors. See you next Tuesday, May 22nd. WOW! What an interesting way to write a book! I'm going to have to pass this along. A modern-day epistolary novel! I'm curious is the book is available in English? SO the text message is a new form of poetry. it is the language of Shakespeare today. Hopefully it will be heard and read far and wide. Sounds like the author has something to say in his escape mode. Even if he thought no one would hear it, they have.